This request is two fold. 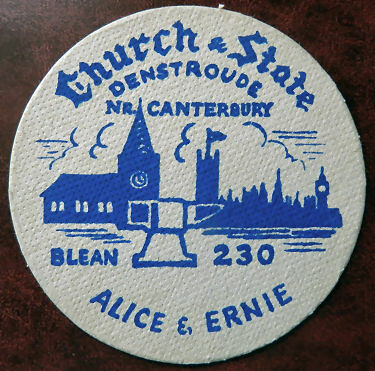 Firstly I have kindly been sent the above image of a pub that used to be in a village called Denstroud, close to Canterbury, called the "Church and State." That is all the information I have on the place, but have managed to Google an image of the building. Does anyone have any further information on this as a pub, as I cannot find anything about it at all. Photos of it open would be even better. Secondly, Mike Lyon, who kindly sent me the image of the beer mat collects those that have been designed specifically for the pub in question. Should anyone have any similar, attached to any other pub, I would be very interested in gaining an image for this web site and Mike would be interested in adding to his collection.